Today I want we are sharing the most popular game we’ve ever played. We call it FREEZE FRAME. As you’ll see, it’s a simple concept, but tons of fun. We’ve also included a sample Freeze Frame (Boy Band Edition) for you to use so that you can get a better idea of what we’re talking about. 1. 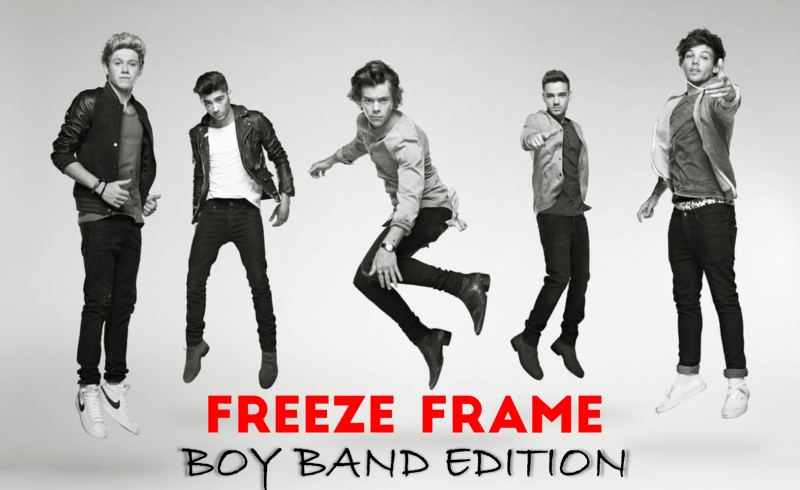 Download FREEZE FRAME (BOY BAND EDITION) (make sure to click “Save As”) to your computer. I actually stumbled upon this game by accident one day when I saw a cheesy picture of the Backstreet Boys online. I though, that would be hilarious to have some people pose like that and send it out as a Christmas card. Yes, I have issues. But enough about me, this game is fairly simple in concept, but takes some time to put together. The game itself requires you to split the group into teams (minimum of 2, but up to as many as you want, with at least 5 or more per team) and have them look at, and then mimic the picture. I recommend that you assign an unbiased leader to each team to clearly let you know when their group is finished. Make sure you have adequate space for groups to work and I also suggest that you encourage every person to get involved in at least one Freeze Frame. The first team to match the frame wins. The real work is done beforehand. You’ll need to find some funny pictures with anywhere from 2-5 people in the picture (see bonus tips). Next, insert them into PP and blow them up (use hi-res pics) so that they’ll be easy to see on the screen. Make sure to put a PP slide with the number of people the “freeze frame” will require. Once you’ve got 10 pictures, let the fun commence! 2. I always have one extra freeze frame in case of a tie. That way you can take the teams that are tied and have one final “freeze” off. 3. Picture suggestions might be as follows: sumo wrestlers, boy bands, football players being tackled, crazy faces, girls putting on make-up, 80’s stars, bad fashion, Facebook photos of students, old pictures of your students, parents or leaders, etc. 4. To up the ante, use pictures of people jumping and incorporate holders into the number of people you use for the picture. 5. If you have a really large group, use pictures with more than five people in it.